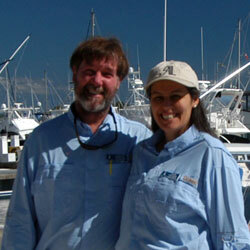 Curtis and Lupe Tucker, have been conducting outdoor corporate team building events in Miami since 2003. Curtis is a Certified Evaluator / U.S. Licensed Facilitator / Test Administrator since 1994, as well as a U.S.C.G. 100 Ton Master since 2003. We Consistently Go The Extra Mile!! History has proven that with the Tuckers’ vast, diverse and impressive experince, Corporate Team Building Miami has done a stellar job for all the companies and corporations that they have worked with on every outdoor, corporate team building event thoughout the past decade. Your Company Is First Class in Miami Team Building! The Tuckers’ superior team building programs in Miami always produce positive, productive, and highly effective outdoor, team building challenges, compromising nothing. We are pleased to offer you a corporate team building event on beautiful Biscayne Bay in Miami, FL, the incredible clear blue waters of the Gulf Stream off shore of Key Biscayne, or the lush green grasses and palm trees of historical Coral Gables, Miami, FL. These incredibly beautiful and tropical locations of Miami in south Florida provide a spectacular mix of warm breezes, calm water, stunning vistas and exciting sailing regattas, sport fishing tournaments, and/or golf tournaments which make for highly memorable and effective corporate team building challenges that are second to none. Our goals include increasing the communication, camraderie, and effectiveness of your corporation’s team attitude and atmosphere. We have worked with groups as small as 6 participants, and as large as 120 participants. Our clients have come from corporations all over the world, and include companies such as PriceWaterhouseCoopers, Mercedes Benz Spain, Chrysler Group Spain, BBVA Asset Management, EDR Group, Robbins Gioa … just to name a few. We provide a complete corporate team building service, which means that not only do we conduct the team building event, if you like we also provide team uniforms, award packages and ceremonies, award banquets, onboard catering, conference team building debriefing, corporate transportation (luxury or standard), etc. We can provide every thing needed for your corporate team building, as well as the logistics for your company’s successful meetings/convention/summit. We can even arrange the accomodations with the resorts, luxury hotels, etc. if you like, including the conference rooms, meeting halls, spas, etc.. Since we have been conducting corporate team building events in Miami for many years, we would like to share some local insight with you and your colleagues. Some sailing & sport fishing captains will advertise team building events, and then most just take you sailing or fishing with a group of boats. Most times they do not actually even stay together as a group, much less do some take part in any compition, or team building activities. That is easy to do. That is just a group fishing or sailing charter for WAY too much money! We are not a yacht charter company that will just take you and/or your colleagues and personnel on Biscayne Bay, or to the Bahamas, sailing. We can arrange a sailing or fishing charter for you if you like, but we are serious, professional Corporate Team Building Facilitators and Coordinators having specialized in the Outdoor Corporate Team Building Events since 2003, right here in Miami. For a highly effective and productive team building program; sailing ragatta, sportfishing tournement and/or golf tournement, we are the team building company you want for your company’s corporate team building event in Miami. We are the team building coordinators and fascilitators that you want to work with. We will always exceed your expectations, and reach your corporations needs and goals because of our experience, passion and success. We always go the extra mile.